State of Digital is sponsoring UnGagged London 2019! Get in with the UnCrowd: London April 1-2, 2019! UnGagged gathers 30+ speakers to cover 2 days and 3 tracks of the most insightful and lucrative Digital Marketing strategies around. No sales pitches, no fluff, no BS – just actionable methods that actually work for them. Need a deeper dive? Grab a Masterclass April 3rd. 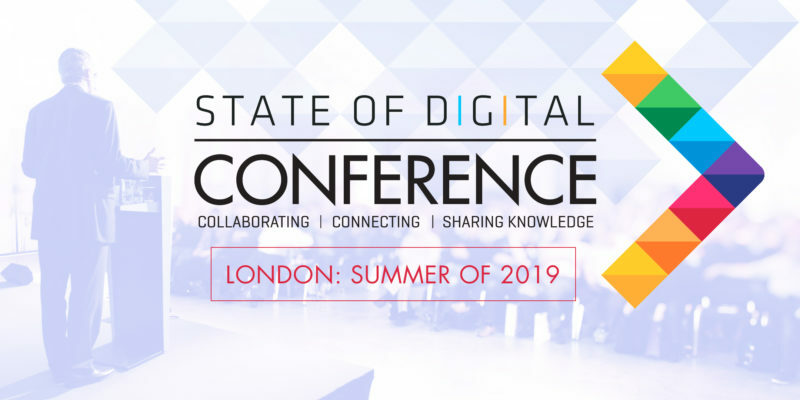 The State of Digital Conference Returns to London in the Summer of 2019! We’ve got plenty of surprises in store, dates and speaker announcements are coming soon! An all-access pass to State of Digital: London at etc.venues County Hall. That’s a full day packed with sessions from the best Speakers in the industry – hand picked by our own State Of Digital Founder Bas van den Beld, and Editor in Chief Barry Adams. One-to-one advice. We’ve packed in plenty of time for quality conversations with attendees, speakers & exhibitors through multiple breaks and networking events. Bas van den Beld – Founder at State of Digital – Lessons from more than a decade in the industry and a fireside chat with Dave Naylor on how to become an SEO rockstar. Barry Adams – Editor in chief at State of Digital & SEO Consultant at Polemic Digital – The Web is Totally and Utterly Fu**ed – and it’s our fault. PLUS a full day Technical SEO Masterclass running on 9th October (separate ticket required). Arianne Donoghue – Editor at State of Digital & Strategy Director at Epiphany Search – How to save your sanity and your job with PPC automation. Jo Turnbull – Editor at State of Digtial & Owner Founder at SEOJoBlogs – LEEPING into a career with voice. Dave Naylor – Founder & SEO at Bronco Ltd – How to become an SEO Rockstar. Jono Alderson – Special Ops Yoast & SEOktoberfest world champion 2018 – Digital Marketing in a post-digital work. Tom Anthony – VP Product Distilled – Runner Up SEOktoberfest world champion 2018 – What if ‘what’s good for users’ isn’t good for Google? Combining CRO and SEO testing. Alex Jones – Head of Earned Media Hallam – How to go big with small clients. Chris Green – Head of Search StrategiQ Marketing – Why SEO “Sticking Plaster” Aren’t the Enemy. Hannah Thorpe – Head of SEO Strategy Found Group Ltd – Scaling SEO Services. James Murray – Product Marketing Manager, Bing Ads EMEA Microsoft – Democratizing AI: The Next Knowledge Equalizer.